Clamp Force or Pre-Load: In the initial stages of the installation process, the the tool engages and pulls on the pintail. The joint is pulled together before the conical shaped cavity of the nose assembly is forced down the collar. This progressively locks (swages) it into the grooves of the harder pin. the pin and swaged collar combine to form the installed fastener. The squeezing action reduces the diameter of the collar, increasing its length, this in turn stretches the pin, generating a clamp force over the joint. Sheer strength of Lockbolts vary according to the material strength and minimal diameter of the fastener. By increasing the diameter or the grade of material, the sheer strength of the fastener can be increased. 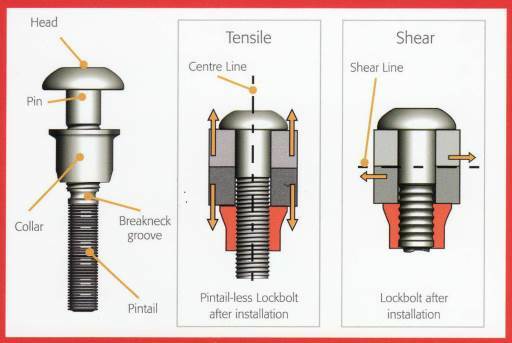 The tensile strength of the Lockbolts is dependent on the shear resistance of the collar material and the number of grooves it fills. The shear strength of structural blind fasteners is generated by the combined resistance against failure of the pin and sleeve. This takes place along the joint’s shaer line between fastened plates. 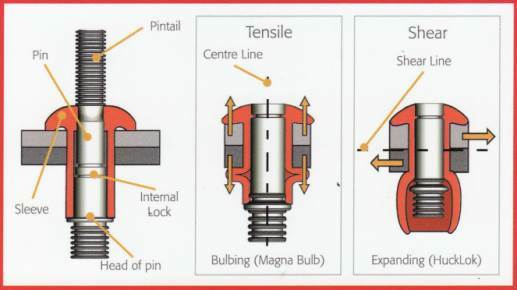 The tensile strength of the structural blind fasteners differs to that of Lockbolts, as they form a blind side positive lock either by bulbing or expanding of the sleeve. the sleeve, assisted by the permanently secured pin, therefore resists failure along its centre line. 1. Bulbing – the sleeve of the fastener is compressed, causing it to fold outwards to form a bulb. This forms itself tightly against the joint material. Once the pin is permanently locked into place the pintail will break off, completing the installation. 2. Expanding – pulling on the pintail causes the head of the pin to draw into the sleeve. this expansion causes a footprint to form against the joint material. Note: The pre-load of blind rivets is generally not published, as it varies widely depending on the application.